Se højdepunkterne i Boston og Cambridge på en hel dag coach tur med en vidende guide. Gå rundt på campuserne i Harvard University og MIT; passere Massachusetts State House og Trinity Church; spise frokost på faneuil hall og spore Freedom Trail til det gamle statshus. Tag en spadseretur ned i Boston Common, og få mulighed for at købe en billet til USS Constitution sightseeing cruise rundt Boston Harbor på denne omfattende rundvisning i Massachusetts hovedstaden. Efter afhentning i Quincy eller Boston, hør en introduktion til historien om hovedstaden i Massachusetts som din tour bus angiver for Cambridge. Cambridge er kendt som hjemsted for Harvard University og Massachusetts Institute of Technology (MIT), to berømte universiteter. Afgår på Harvard University for at besøge Memorial Church, Memorial Hall og Harvard Yard, hvor Lies Status er placeret. En kort tur tager dig til MIT campus, et kraftværk for videnskab og teknologi. Fortsæt til Trinity Church og Massachusetts State House, der har udsigt over den store park kendt som Boston Common. Nyd en kort gåtur i Boston Common, og kør derefter langs dele af Freedom Trail, en 2,5 km (4 km) spor gennem downtown Boston, der passerer vigtige historiske steder, herunder Paul Revere House og Old State House. Stop i omkring 1,5 timer for at nyde frokost (egen regning) på Faneuil Hall, en historisk markedsplads, der er en del af Boston National Historical Park og Freedom Trail. Efter frokost tager du til Long Wharf, hvor du kan tage en 45-minutters Boston Harbour-krydstogt (egen regning) for at se USS- forfatningen og andre vartegn omkring havnen, en af ​​USAs historiske søhavne. Din tur vender tilbage til dit udgangspunkt efter krydstogt om eftermiddagen. The tour, the van, the information and the guide were good and professional, but we did not liked the lunch in a chinese restaurant. too confused and expensive. we ate lobster but not tasty and at night I had a bellyache and my intestines complained! we expected a free time for lunch at the Quincy Market. This was by far the worst tour I have been on so far and I generally really enjoy everything I have booked with viator. The guide could not be understood but did not matter anyway because he barely spoke during the entire day, had almost no information at all. I do not recommend anyone to join this tour. This is designed mainly for visitors, and the tour guide has very limited knowledge... so bad that I think they are part timer. The tour is not well organized at all. 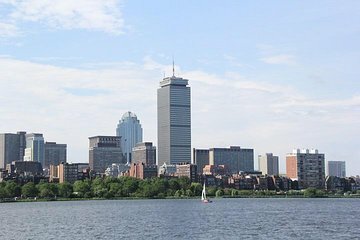 While Boston is a fantastic place to visit, this tour left a bad taste on our Boston trip. This tour was not at all what it was advertised to be. We were only allowed 1/2 hr. at MIT, there was no tour. We were told to use the restrooms there. Got to see 1 bldg., the one with the restrooms. We were not able to go in the Trinity Church. We could only take pictures from the outside and were given 10 minutes to do so. We only drove by the State House. No stopping. No pictures. No tour. We did not have a short walk in Boston common. We did not drive the Freedom Trail. Granted, we drove on part of the Trail, as it practically covers the whole city, but there was nothing more than that. Also, a lot of the tour was being simultaneously translated into Chinese, which I found very distracting. We left the tour at Faneuil Hall, as it wasn't much of a tour at all. VERY DISAPPOINTED. I DO NOT RECOMMEND TO ANYONE!